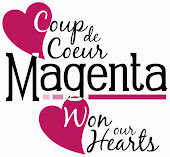 Magenta: S'il te plaît... apprivoise-moi ! / Please... tame me! S'il te plaît... apprivoise-moi ! / Please... tame me! Dans la nouvelle collection de Magenta, il y a 2 phrases avec des citations de Saint-Exupéry. Alors, voilà, avec l'étampe du renard, j'attire votre attention sur ces belles phrases. et voici un extrait du texte du livre "Le Petit Prince - chapitre XXI"
In Magenta's new collection, there are two phrases of Saint-Exupéry proverbs. And with the fox stamp, I want to capture your attention on these beautiful phrases. And here is an excerpts of the book " The Little Prince - chapter XXI"
[...] - Adieu, dit le renard. Voici mon secret. Il est très simple: on ne voit bien qu'avec le cœur. L'essentiel est invisible pour les yeux. - C'est le temps que tu as perdu pour ta rose qui fait ta rose si importante. -Goodbye," said the fox. "And now here is my secret, a very simple secret: It is only with the heart that one can see rightly; what is essential is invisible to the eye." -What is essential is invisible to the eye, the little prince repeated, so that he would be sure to remember. -It is the time you have wasted for your rose that makes your rose so important. -It is the time I have wasted for my rose--" said the little prince, so that he would be sure to remember. -Men have forgotten this truth," said the fox. "But you must not forget it. You become responsible, forever, for what you have tamed. You are responsible for your rose . . .
-I am responsible for my rose," the little prince repeated, so that he would be sure to remember. What a beautiful way to tell someone that we care for them. To thank them for taking care of your home, your pets..